The 1st Azerbaijan International Advertising and Printing Exhibition AdPrint 2018 and 1st Azerbaijan International Gifts and Promotional Products Fair Gift & Promo Fair 2018 will be held for the first time in Azerbaijan, hosted at the Boulevard Hotel Baku from the 20th to the 22nd of September. New exhibition projects will acquaint you with all the variety of the advertising world and its rapidly changing trends and give you a clear picture of development trends in the souvenir market. This year, 26 companies from 9 countries are taking part in the exhibitions. 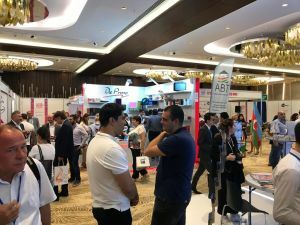 The AdPrint exhibit will serve as the most effective tool for attracting new partners and conducting market research; it will be a unique venue where innovative products and services in the field of advertising and print production will be showcased. The 1st Azerbaijan International Gifts and Promotional Products, Gift & Promo Fair 2018 will be held for the first time in Azerbaijan on 20-22 September at Boulevard Hotel Baku. The Gift & Promo Fair 2018 will present a huge assortment of souvenir products in various categories, while showcasing the latest global trends in gift products, home decor items, tableware, festive products, business gifts, corporate giftware, jewellery, etc. Companies from Azerbaijan, Germany, Indonesia, Kazakhstan, China, Russia and Ukraine take part in this debut of the Gift & Promo Fair 2018. A number of participants at the exhibition will conduct master classes. For three days, participants will present their creations in promotional products, gifts, gift boxes, leather products, including but not limited to folders, boxes, bags, wallets, and all kinds of souvenirs and textile goods such as T-shirts, caps, jackets, scarves, flags and much more. Visitors can get acquainted with original solutions for business gifts, hand-made products and exclusive ideas for corporate gifts. The exhibitions are accompanied by an interactive business programme. Thus, on the first day of the exhibition, B2B meetings will be organised between exhibitors and potential customers, enabling them to conduct business negotiations without intermediaries and to establish valuable contacts. On the second day, meetings between participating companies and their potential customers will continue but under a different format; at these meetings customers will act as the main speakers and will tell about their expectations from promo companies, what products are lagging behind in demand, and in turn, the companies will have the opportunity to put forward their best ideas in terms of highest quality for affordable prices. Such talks will contribute to the development of the market and further establish mutually beneficial relations among the market participants. Moreover, for the first time at this exhibition, promotional clothing will be displayed; this “fashion show” will help exhibitors demonstrate visually their quality and capabilities in both production and branding of clothing. For this exhibition season, the organisers launched a new loyalty programme for exhibition visitors. The programme allows visitors to purchase products and services from exhibitors at a discount. A list of companies taking part in the loyalty programme and ready to provide their products and services at a special price can be found on the exhibition website as well as at the registration deck. To receive a discount on products that interest you, visit the exhibition where you will be given a visitor’s badge with a code. On the website, select Visitors Loyalty Programme in the navigation menu and enter the code number printed on your badge. A voucher will be sent to your e-mail that you can present in hard copy or on your device at the time of purchase. Note also that this discount is valid for purchases made not just at the exhibition but also for six months following the exhibition. Displays of famous brands and new trade marks, an abundance of marketing information, business communications with partners and finally, a festive holiday atmosphere – you will find all this at the AdPrint 2018 exhibition and Gift & Promo Fair 2018!